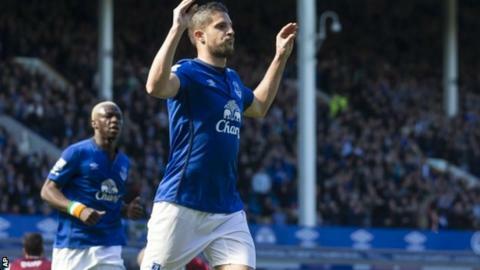 Kevin Mirallas scored the winner as Everton sent 10-man Burnley to the bottom of the Premier League. Mirallas finished off James McCarthy's cross at the second attempt after Ross Barkley's 10th-minute penalty had been saved by Burnley goalkeeper Tom Heaton. The visitors did not recover once Ashley Barnes had been sent off for his second booking just before half-time. Danny Ings missed a late header for Burnley, who have now gone almost six and a half hours without scoring. Aaron Lennon has impressed for Everton recently and it was his run that earned the hosts their spot-kick. Contact from David Jones seemed to be marginally outside the box but it didn't matter as Heaton dived to his right to save Barkley's penalty. With a record of 14 successful penalties from the 15 he has taken in the top flight for Everton, it was a surprise Leighton Baines had not been asked to take it, especially as striker Romelu Lukaku was on the bench. Baines was soon firing towards goal, although his angled effort was saved by Heaton at the second attempt. Lennon was just wide with a 20-yard effort before Mirallas made the breakthrough. The Belgian needed two attempts to finish off McCarthy's cut-back, eventually netting his first Premier League goal in 2015. Jones wasted a glorious chance to equalise immediately when he blazed over with just Tim Howard to beat. In between needing two bouts of treatment, Danny Ings, without a goal since 11 February, was denied a clear shooting opportunity by Gareth Barry's perfectly-timed sliding challenge. Barnes had already been booked for sliding in dangerously on McCarthy, although there was no actual touch, when he caught Seamus Coleman just before half-time and was shown a second yellow card. It meant the player who had committed the most fouls in the Premier League this season was sent off for the first time, meaning he will be suspended for next Saturday's crucial encounter with Leicester. Burnley's players were unhappy and defender Michael Duff had to be pulled away from referee Mike Jones as the teams headed for the tunnel at the end of the half. The mood of Clarets boss Sean Dyche was not improved when Mirallas caught George Boyd with a nasty-looking tackle at the start of the second period. The challenge was described as "disgraceful" and "a leg-breaker" by former Blackburn and Celtic striker Chris Sutton on BBC's Final Score, but the Belgian was only booked. McCarthy, Lennon and Barkley all failed to take opportunities as Burnley found it difficult to exert any pressure. Ings had their best chance but headed Kieran Tripper's cross over and Everton claimed their fourth win in five games and their fifth clean sheet in seven. "A lot of people have talked about my future. "I am in my best form of the season. When it is finished I will talk to my partner, the president, the trainer and manager. "But I am confident here and I like to play for Everton." Match ends, Everton 1, Burnley 0. Second Half ends, Everton 1, Burnley 0. Foul by Lukas Jutkiewicz (Burnley). Offside, Everton. Leighton Baines tries a through ball, but Romelu Lukaku is caught offside. Attempt saved. Ross Barkley (Everton) right footed shot from outside the box is saved in the centre of the goal. Assisted by Gareth Barry. Corner, Everton. Conceded by Kieran Trippier. Attempt blocked. Scott Arfield (Burnley) left footed shot from outside the box is blocked. Kieran Trippier (Burnley) wins a free kick in the defensive half. Substitution, Everton. Muhamed Besic replaces James McCarthy because of an injury. Attempt blocked. Matthew Taylor (Burnley) left footed shot from outside the box is blocked. Assisted by Jason Shackell. Corner, Burnley. Conceded by Gareth Barry. Attempt missed. Danny Ings (Burnley) header from the centre of the box is too high. Assisted by Kieran Trippier with a cross. Substitution, Burnley. Matthew Taylor replaces David Jones. Substitution, Burnley. Ross Wallace replaces George Boyd. Gareth Barry (Everton) wins a free kick in the defensive half. Attempt missed. James McCarthy (Everton) left footed shot from outside the box is close, but misses to the right. Assisted by Ross Barkley. Substitution, Everton. Steven Naismith replaces Arouna Koné. Danny Ings (Burnley) wins a free kick in the attacking half. Attempt saved. Gareth Barry (Everton) left footed shot from the centre of the box is saved in the centre of the goal. Assisted by Leighton Baines with a cross. Leighton Baines (Everton) wins a free kick in the attacking half. Foul by Michael Duff (Burnley). Attempt missed. Seamus Coleman (Everton) right footed shot from outside the box misses to the right. Assisted by Ross Barkley. Delay in match Leighton Baines (Everton) because of an injury. Delay in match Phil Jagielka (Everton) because of an injury. Attempt saved. Aaron Lennon (Everton) right footed shot from the centre of the box is saved in the bottom right corner. Assisted by Arouna Koné. Foul by Romelu Lukaku (Everton). Michael Duff (Burnley) wins a free kick in the defensive half. Attempt saved. Leighton Baines (Everton) left footed shot from outside the box is saved in the bottom right corner. Assisted by Aaron Lennon. Corner, Everton. Conceded by Ben Mee. Attempt blocked. Leighton Baines (Everton) left footed shot from outside the box is blocked.